You are always perfect! I love visiting your blog. It never disappoint me. Not only are you beautiful but also your style is just adorable. Adorable! Your hair is so beautiful! Btw, I’m in love with your belt! Great way to incorporate a bit of military style into a look! It looks def stylish yet laid back and versatile! i like so much the coat!!! Really like this outfit and your blog too, following you! I love your look , your coatl is cute.Kisses. oh i love your military look:) and glasses,accessories are cool! Love all the shades together, especially the belt looks so good with the parka! you’ve got an amazing style and these pictures are beautiful!! Ciao!grazie mille per essere passata da me, mi ha fatto molto piacere il tuo parere,ti seguo con piacere e spero che passerai a trovarmi nuovamente. I LOVE THIS MILITAR LOOK!!! The second picture is really great! And your hair looks amazing in these pictures! You are my kind of beauty! Love you outfit a lot! sweetie, this is perfect look, that parka is gorgeous! and your hair is beautiful, great photos and location! A simple but a perfect outfit!! I wear in a similar way many times!! lots of beautiful hair! nice look to! Beautiful pictures, love your jacket! I love this parka!!! Thanks for saying yes!!! This jacket is perfect! I have a similar jacket, and it can literally go anywhere and do anything. OMG love that jacket! You did an amazing job styling it! Your hair looks beautiful curly like this. Wow you look INCREDIBLE! You always look fantastic in your photos. Oh, I’m in love with your hair hahaha Amazing outfit. And your parka is love it..
very nice outfit. love the sunglasses! You look great ! LOVE IT. Great look! Love the bracelet, and your hair are so beutiful! amazing look! :) love your jacket! Another great outfit :) those glasses are amazing! Such a great way to style this amazing military jacket. I love it belted and over shorts and tights. Just gorgeous. Gorgeous, I love love your hair down! Wow! Great styling, I esp love this shade of olive – love it! You have a great sense of style. It’s a perfect outfit. Cool and elegant, a nice mix. Love your coat and your sunglasses. @ Mom Fashion World I use Olympus E 420 with extra lens 70-300 mm. thank you for your lovely comments always! You look like a badass military chic; it looks awesome. Also, your hair is fabulous. It looks so bouncy and fluffy! This combination is such a perfect outfit for today, I mean Sunday! :) Love this military touch! ;) U look pretty as always! Enjoy your Sunday!! Great pics!! And the outfit is amazing, love it!!! Well girl! Looking so pretty with your wavy locks! Love it! 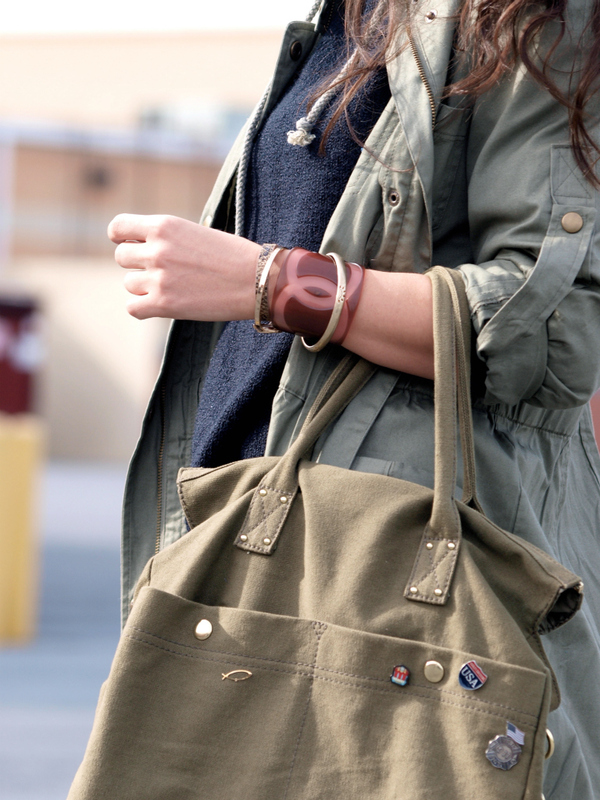 Yup, you can’t go wrong with military – love this relaxed look on you. Military never goes out of fashion! Hope you’re keeping well my little colour angel. The outfit is perfect! I love it! wow great outfit! and you have great pictures as well… i love your hair it’s so beautiful! That parka is TDF!!!! My mouth is agape lusting for it!!!! Your hair looks amazing and so does this outfit! Nice blog, I’m following you now. I LOVE this outfit! I’ve been meaning to get that sort of jacket, it looks great on you! awesome awesome outfit!! Love the jacket! you look so beautiful with your hair like this Veronica!!! and belting your military jacket is fab! !